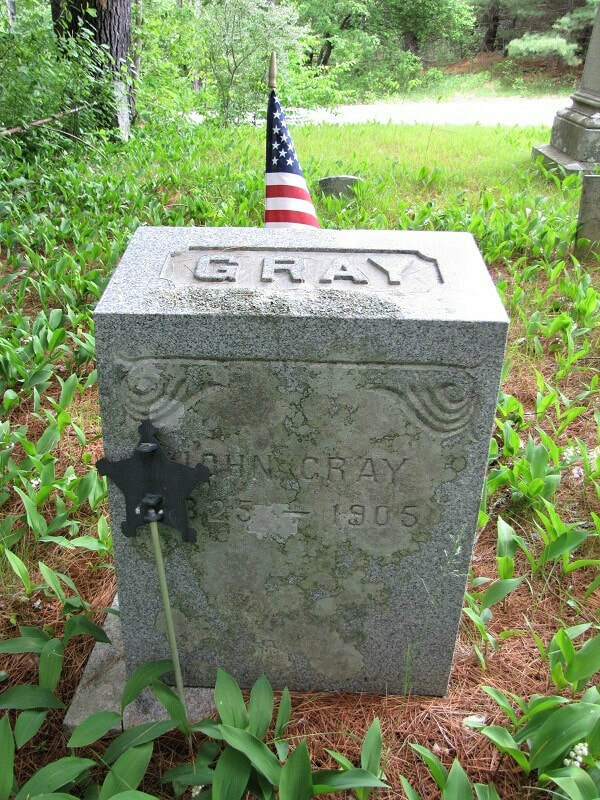 ​JOHN GRAY was born in South Berwick, Maine on 3 August 1825 [Bio Review, pg 583], the son of George and Theresa (Emery) Gray. He died there on 5 Oct 1905 [ME VR], aged 80 yrs, 2 mos, 2 days from a gastric ulcer and cancer of the liver, and was buried in the family graveyard located on his farm on (what is now called) Rodier Road in South Berwick [YCCI, pg 2099]. ​He was first married to TEMPERANCE WINN, the daughter of Capt Joshua and Nancy (Eaton) Winn of York, on 17 July 1847 [Bio Review, pg 584]. She was born circa 23 Nov 1828 [based on age at death], and died on 18 May 1857, aged 28 yrs, 5 mos, 25 das. She is buried in her husband's family plot in South Berwick [YCCI, pg 2099]. On 9 June 1858, he married ROXANNA E GOODWIN, the daughter of the Rev Charles E Goodwin [Bio Review, pg 584]. She was born 1838-39 in Lebanon, and died on 6 July 1876 at age 37 [gravestone]. She is buried in the Gray family plot [YCCI, pg 2099]. He thirdly was married to the widow MARY ELIZABETH (BOULTER) LIBBY on 18 Mar 1878 in South Berwick [VR of Ber, So Ber + No Ber, pg 469]. She was born in Buxton, Maine on 28 Oct 1831 [Buxton VR], the daughter of William T and Mary (Bradbury) Boulter, and died on 17 Mar 1887, aged 56 yrs, 4 mos, 27 das [YCCI, pg 716] (this age at death would calculate out her birth date as 18 Oct 1830). 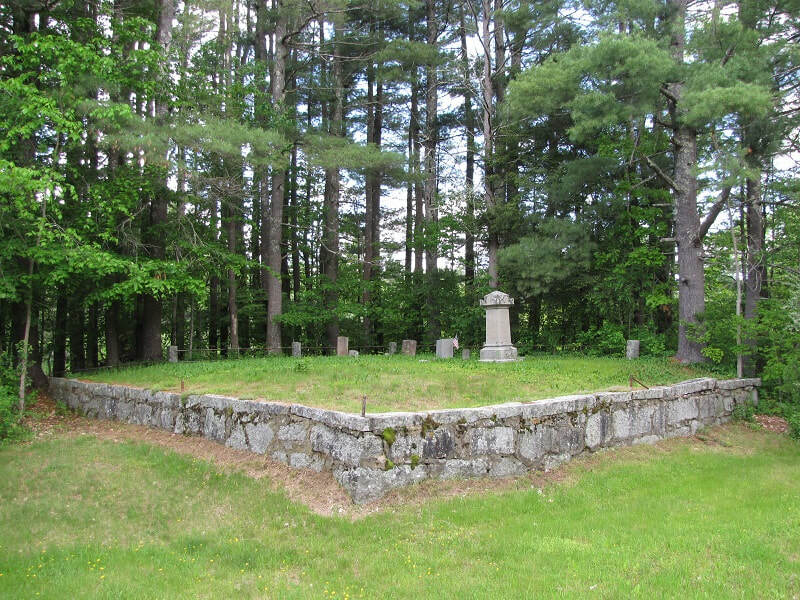 She was buried with her first husband, Amos Libby, in Hillcrest Cemetery at Hollis, Maine. On 26 Oct 1888, he married MARY E BERRY. She was born in Portland, Maine on 11 Aug 1850, the daughter of James and Eliza (Emery) Berry [NH Death Rec]. She died in Farmington, NH on 4 July 1924, and was buried in the town's Pine Grove Cemetery [NH VR]. She had been a resident there for 17 years, previously being from North Berwick. John Gray was a deacon of the South Berwick-Wells Christian Church, of which he was a founder in 1864. Though listed as a farmer in all of the census records, he was also a school master for 14 winters, as well as holding several town office positions (including selectman for five years, tax collector in 1848-49, school super. in 1876, on the school board for six years, and Justice of the Peace for decades). His brother, George W Gray, also served in the 27th Maine, as did 1st cousin Sylvester Gray (son of his Uncle Caleb). i. VIOLA M GRAY, born 23 Feb 1850 [Bio Review, pg 584]. She died in 1938 and was buried in Woodlawn Cemetery, South Berwick [YCCI, pg 2002]. 1. Nellie T Gray, born ca 1879 [1880 So Berwick census] in North Berwick [ME Marr Rec]. She was married to Frank A Bryam on 29 June 1904 in South Berwick [ME Marr]. He was born in Amesbury, MA, the son of Charles C and Esther A Bryam. They lived in Waltham, MA [1910-20 censuses], having children Charles W and Helen L.
2. John William (also seen as William J) Gray was born 17 May 1882 in South Berwick, and died 14 Sept 1908 [YCCI, pg 2099]. He was buried in the Gray family plot in South Berwick. He married 15 June 1904 in Boston, MA [MA Marr] to Iva L MacGregor, the daughter of William and Mary (Richardson) MacGregor. She was born in St Stephen, NB [Marr Rec]. They had two children, Alden Wesley born 2 May 1905 in Boston, and Gertrude Pearl, born 12 Aug 1906 in Waltham. iii. LAVONIA (or LOVINA) EATON GRAY, born in South Berwick on 9 Dec 1855 [VR of Ber, So Ber, No Ber, pg 522]. She died in 1936 and was buried in Woodlawn Cemetery, South Berwick [YCCI, pg 2002]. She was married to EDWIN W HANSCOM in South Berwick on 31 Aug 1879 [ME Marr Rec]. He was born in Jan 1847 [1900 census] and died in 1933 [YCCI, pg 2002]. They had no children. They both lived their lives in South Berwick, where Edwin was a farmer. 1. John Edward Chick, born in Colton, CA on 28 Apr 1896. He died in Lakewood, OH on 7 Aug 1925, and was buried in Twinsburg Cemetery, Twinsburg, OH [OH Deaths 1908-1953]. He had a wife, Lillian R. In 1910 census, he was living with his aunt Susan Stetson in Mooers, NY. vi. CHARLES E GRAY was born 22 Oct 1869 and died 5 Mar 1870 [Bio Review, pg 584]. He is buried in the family plot in South Berwick [YCCI, 2099; transcription lists a stone marked "C E G"]. 1880 So Berwick census (pg 45): hh 409/451: surname written as "Grey"
1900 So Berwick census (pg 18B): owned farm on "John Gray Road"